Everyone has a love story to tell. It doesn’t matter that it is a sweet and bitter tale of the our past or current romance, as all of us had gone through these bittering hardships in the journey of finding the soulmate that we have been wanting the most. Yes, we may lose some who are important to us on the way, such as the girl or guy crush we have been thinking so much day and night but sometimes, it is not within our power to make it happen. Sometimes God, may show that this is not the one who is meant to be and He is saving you for something that is better, fated and destined to you. 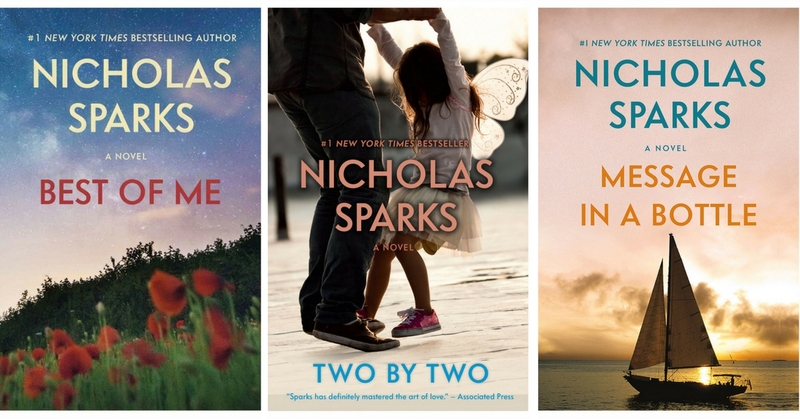 While holding on to that, let’s read some of these touching yet heartbreaking romance novels by the legendary author of romance, Nicholas Sparks. Theresa Osborne, a widowed mother of a 12 year old has found a bottle that is washed up ashore containing a message that is so touching of a man to his beloved wife who has passed on. Determine to find the man behind the letters for his story to be published, Theresa meets Garrett and eventually they develop mutual understanding and feelings for each other but as complications and intensity arise, could they remained together regardless? What started as a reluctance for Landon Carter, a senior class president in asking Jamie Sullivan as his date for prom, turns to one of the best decisions he made in his life, having to realized her kindness and sympathy for her, Landon begins to have true affection for her but at the same time, he found out that Jamie has leukemia. After the death of her husband, Julie Barenson is presented with two gifts from him, an adorable puppy named Singer and the promise that he would always be watching over her. However, Julie felt that she is too young to given up on love and she is torn between a handsome engineer who treats her like a queen or the down-to-earth nice guy who was a best friend of her husband in this chilling story that turns into a game of jealousy and suspense. The Notebook tells the story of Noah Calhoun who returns to his home from World War II to resume his plantation business but he is still attached to a beautiful girl that he has met years ago. What seem like only a memory he could treasured, the girl of his dreams came to his town only to find out that she is engaged to another man. Still, the story doesn’t end there, as Allie Nelson is still struggling in her own world between choosing paths. The kindling romance between two star-crossed lovers extinguished when John, a military man came home from a mission only to find out that his true love has been married to another. Bonds are loosen. Hearts are broken. But Savannah is not entirely in love with her husband and still had feelings for John, yet John is ready to let go in order to not make things further complicated. Fans of teen romance are sure to have a hell of a ride reading this touching story of two former high school sweethearts are reunited after years of apart at the funeral of their mentor, thus rekindling their past relationship. Could the flames of the former star-crossed lovers burn bright again? Having to take things for granted in all his life, 32 years old Russell Green is forced to go through a single parenting life with his six years old girl after his wife left to pursue her own personal career. Will he be able to manage his new life and handle the severity of the responsibilities and challenges that are thrown to him?